General George S. "Old Blood and Guts" Patton, Jr., VMI Class of 1907, was the third generation of his family to attend VMI. His grandfather, Colonel George S. Patton*, Confederate States Army (CSA), VMI Class of 1852, and grand uncle, Colonel Waller Tazewell Patton** (CSA), VMI Class of 1855, had both died during the American Civil War. 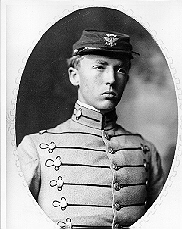 His father, George S. Patton, had graduated from VMI in 1877. Young Patton arrived at VMI to fulfill the family military legacy, but transferred to the United States Military Academy (West Point) after one year. Graduating from West Point would assure Patton of receiving a direct commission in the U.S. Army; a goal he could not have been assured by graduating from VMI. *George S. "Old Blood and Guts" Patton's grandfather, Colonel George S. Patton, was killed in the 3rd Battle of Winchester in September 1864. **Colonel Waller Tazewell Patton was mortally wounded at the Battle of Gettysburg. Recommended Viewing: Patton (Two-Disc Collector's Edition) (1970). Description (Essential Video Review): One of the greatest screen biographies ever produced, this monumental film runs nearly three hours, won seven Academy Awards, and gave George C. Scott the greatest role of his career. It was released in 1970 when protest against the Vietnam War still raged at home and abroad, and many critics and moviegoers struggled to reconcile current events with the movie's glorification of Gen. George S. Patton as a crazy-brave genius of World War II. Continued below. How could a movie so huge in scope and so fascinated by its subject be considered an anti-war film? The simple truth is that it's not--Patton is less about World War II than about the rise and fall of a man whose life was literally defined by war, and who felt lost and lonely without the grand-scale pursuit of an enemy. George C. Scott embodies his role so fully, so convincingly, that we can't help but be drawn to and fascinated by Patton as a man who is simultaneously bound for hell and glory. The film's opening monologue alone is a masterful display of acting and character analysis, and everything that follows is sheer brilliance on the part of Scott and director Franklin J. Schaffner. Recommended Reading: The Pattons: A Personal History of an American Family (The Warriors). Review: In writing this study of his family, General Patton's grandson has used much material not made available to previous biographers. Still, his focus is inevitably and properly on the general himself, who appears to have been an even more complex personality (to put it delicately) than previous studies have indicated. But the general was not the only exotic branch on the Patton family tree, which appears to have abounded in eccentrics such as an editor would find hard to accept in a fictional family saga. Continued below. The present Patton tells the whole story with compassion and balance but makes harsh judgments where they are called for. He also shows such literary skill as to make one hope this will not be his last book. Recommended Reading: Patton: A Genius for War (1024 pages). Review: Perhaps the most renowned and controversial American general of the 20th century, George Patton (1885-1945) remains a subject of intense interest. D'Este (Decision in Normandy) provides new information from family archives and other sources about Patton's ancestry, childhood and pre-WWII military career. This includes his student years at West Point, his experience as a tank officer in WWI and various interwar staff assignments. The author emphasizes Patton's lifelong study and preparation for war and his conviction that God not only chose him specifically to lead an army but also stood ready to intervene to assure him battlefield victories. D'Este has much to say about Patton's impulsiveness, impatience and tactlessness, showing how these qualities often got him in trouble with the public as well as with his superiors. Continued below. The account of Patton's campaigns from North Africa through Sicily, Normandy and the Ardennes enables the reader to understand why the general is regarded as one of the great military leaders. This is a major biography of a major American military figure. Recommended Viewing: America at War Megaset (History Channel) (Number of discs: 14) (Run Time: 1948 minutes). Description: From the first musket shots at Lexington and Concord to the precision-guided munitions in modern-day Baghdad. America's history has been forged in the heat of battle. AMERICA AT WAR presents twenty-five documentaries from THE HISTORY CHANNEL charting U.S. military conflict over two centuries. This "fourteen disc set" explores key moments of the American Revolution, the Alamo, Mexican American War, the Civil War, Spanish American War, World Wars I and II as well as the conflicts in Korea, Vietnam, the Persian Gulf, and Iraq. Continued below. Recommended Viewing: The History Channel - The Battle History of the United States Military (2005) (Number of discs: 5) (766 minutes). Description: A mighty compendium of America’s five major military branches--Marines, Navy, Army, Air Force, and Coast Guard--THE BATTLE HISTORY OF THE UNITED STATES MILITARY trumpets the myriad strengths of one of the world’s greatest military powers. Plunge headlong into the great battles fought on land, sea, and air. Marvel at the arc of musket to missile. Meet the key figures and lesser-known heroes who have shaped the organization, the strategy, and the future of the United States armed forces. Encompassing over two centuries of courage and conquest, THE BATTLE HISTORY OF THE UNITED STATES MILITARY marches through America’s military development from its earliest Coast Guard days to the technological wonders of the Gulf War. Continued below. With official government documents, extensive combat footage, and commentary by historians and decorated veterans, THE BATTLE HISTORY OF THE UNITED STATES MILITARY is a full-scale, full-dress salute to the men and women who give and have given to America’s fight for freedom. DVD Features: Downloadable Historical Documents; Branch Heraldries; Bonus Film: "Pageantry of the Corps"; Interactive Menus; Scene Selection. Recommended Viewing: The World at War (30th Anniversary Edition) (1357 minutes) (A&E). Description: Sir Jeremy Isaacs highly deserves the numerous awards for documentaries he has earned: the Royal Television Society's Desmond Davis Award, l'Ordre National du Mérit, an Emmy, and a knighthood from Queen Elizabeth II. His epic The World at War remains unsurpassed as the definitive visual history of World War II. Continued below.